Some shows learn from their mistakes. They look back at their season, identify what went well and what didn't, and make sure the next season is fixed appropriately. Orphan Black understood its third season was convoluted, so it cut back on characters by its fourth. Hannibal worked out that its first season was too literal, so it dived deep into the abstract for its second run. Breaking Bad decided its first season was just a tad too light and silly, so it darkened the tone as quickly as it could. Game of Thrones is a peculiar beast when it comes to course correction in that it seems to identify its flaws in everything besides narrative progression. There's too much Dorne in season five, so it hardly appears in season six: perfect. The women are feeling underwritten, so they're focused on more as soon as possible: handled excellently. But Game of Thrones' biggest issue since day one has always lied with its structure and its pacing, and it hurts me a little to have to write that the show is no closer to fixing these problems, and is showing no signs of ever even trying. That's not to say this isn't a good episode, because it is. It's a solid finale that wraps up a bunch of plot threads nicely and leaves us gasping in anticipation for the next season, so as a finale it mostly does its job perfectly. But it's as an episode in general that "The Winds of Winter" doesn't entirely come together. Characters bounce from location to location jarringly, others offer powerfully sincere words of support without real motivation behind them, and some even offer a complete disregard of basic in-show logic. It's not that the episode feels rushed, but more like the showrunners plotted episodes one through nine, then wrote the next season's premiere and had 70 minutes here to fill in the gaps and get everyone where they needed to be. Naturally, a handful of plots work perfectly - King's Landing and Winterfell offered some seriously excellent moments tonight, which we'll come to shortly - but a bunch of others left me feeling cold and underwhelmed. On the surface the episode appears fine, and I enjoyed it a great deal in the moment, but it's when you think back on how a lot of these endings came to be that you realise a lot of it doesn't really hold together. 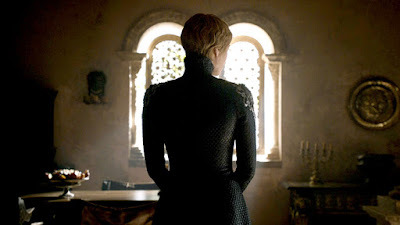 I like to consider myself an optimistic person, so we'll begin with the good: everything in King's Landing tonight was masterful television. The show essentially adopts an entirely new aesthetic for this opening twenty five minutes: ominously calm piano music guides us through the trial; the camera seriously toys with perspective by looking up at a handful of characters and refusing their eye line; the editing cuts between four parts of the city simultaneously, thus breaking the show's tradition of sticking to a scene-by-scene basis. When Cersei's plan comes together and the wildfire detonates, Margaery is engulfed in flame, but it happens so fast that it's impossible to really process. It takes a while to accept her death, and the moment we regain our focus, Tommen commits suicide. For a show that struggles with structure, this was handled expertly. Cersei's cold dismissal of her son's corpse is harrowing, and her torture of Septor Unella is deeply distressing. When Jaime returns to the city and watches Cersei's coronation his face is riddled with emotion, but Coster-Waldau's acting here is superlative: he doesn't have to speak, but we know that when he sees his sister and lover before him in that moment, all he can see is King Aerys. Director Miguel Sapochnik, as well as writers Benioff & Weiss, set their sights on a lot here, and they stick every single landing with ease. It was unpredictable, it was thrilling, and it was exciting. It's Game of Thrones at its best. Equally, the North powered through some big moments in the finale and largely succeeded. 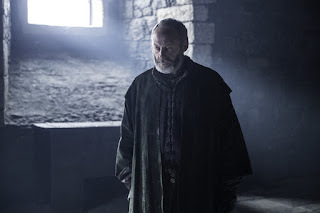 Jon's dismissal of Melisandre after a devastated Davos reveals the truth is a scene that feels both justified and unfortunate: Melisandre deserves what's coming to her, but if this means the end of Carice Van Houten's terrific performance I'll be deeply sad. The Northern houses declaring Jon as the King in the North is also an empowering scene, and one that finally builds to an incredible and satisfying payoff after what seemed like an agonisingly long wait. To see him and Sansa side by side at the table in Winterfell is exciting enough, but the episode also brings the knowledge that Winter has finally arrived. This episode alone doesn't do much to show this, but it doesn't need to. The show's history has done that for us. Bran fared less well here, with his vision back to the Tower of Joy ultimately amounting to far less than the sum of its parts. The confirmation that Jon is Rhaegar and Lyanna's son should be monumental, but it was played out with such a formulaic approach and with so little emotion that it felt more like fan service than character development. Blocking the viewer from hearing Lyanna's whispers seems pointless should this be the end of this revelation, but I can't see where else it can go. Perhaps the show will surprise us all, though, and add another layer to the history. Only time will tell. Meereen was mostly solid tonight too. Dany's dismissal of Daario is an odd scene at first in that it completely lacks emotion, but Daenerys' ultimate admission to Tyrion that she felt nothing towards sending him away makes the reasoning for this clear: the sequence perfectly places us with Dany. The episode's script, and Emilia Clarke's superb performance here, force us into Dany's position without telling us, and it only makes the scene more upsetting to look back on. Its incredibly clever writing, the effect of which doesn't really hit you until after the episode finishes. Meereen ends strongly too: Dany has the support of the Greyjoys, the Tyrell (note the singular word there...) and the Martells, and she sets sail for Westeros. I appreciated Daenerys making Tyrion her Hand of the Queen, but his line about how she has reignited his faith in the world didn't ring true. 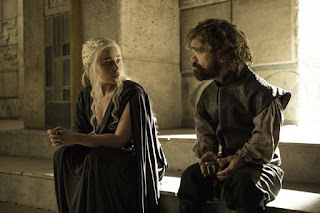 Sure a lot of stuff probably happened off screen with them, and I get that it's more symbolic than anything else, but what Tyrion actually says is a huge personal statement, and the very few scenes we've seen of Dany and Tryion together haven't done enough to make me believe what Tyrion says. It's a shame, because this could have been a powerful moment for him, but the script overreaches and ultimately falls flat. I mentioned the show's issues with pacing earlier. Let me get this clear first: the timeline in this episode does make sense. It can be mapped out and followed and it adds up. The issue is that you kind of have to create alternatives and fill in the blanks yourself, and it forces the episode to cover an enormous time span in one offering. Jaime begins at the Twins, and we can see the girl who is later revealed to be Arya loitering around. Jaime then leaves and heads back to King's Landing, and then we see the girl reveal herself as Arya to kill Walder Frey. But to do this, she would have had to trick or kill the guards and the chefs, abduct and kill the Frey sons, mutilate them, put them into the pie, and serve them to Walder Frey without anyone catching on. Frankly, it's a ludicrous piece of storytelling. But, more than that, it forces Arya's timeline into an uncomfortable place. How long has she been at the Twins? Or in Westeros in general, in fact? Are we to assume Jaime's scene in King's Landing takes place long after the Frey murder? 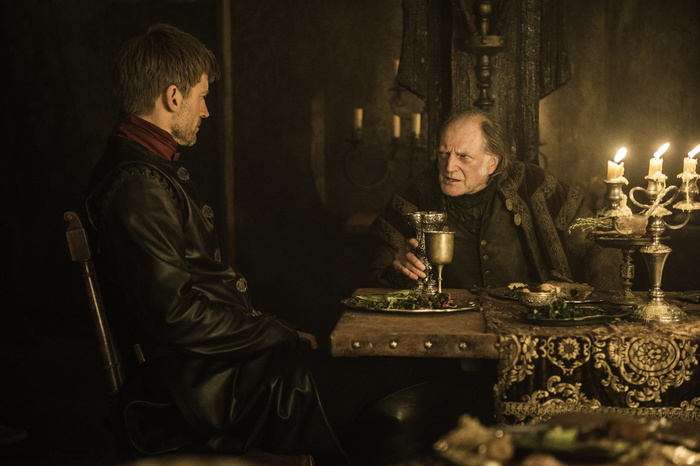 Or is the Frey murder much later after Jaime left and simultaneous with his arrival in King's Landing? It's messy, and even though it can be explained rationally it's something that viewers should not have to do for themselves. The episode plays tricks on the viewer and exploits this for shock value. So yeah, Arya has crossed another name off her list and I'm glad to see Walder Frey go, but it was at the cost of Arya's narrative momentum. She just began a new story in a finale that saw everyone else's stories begin to wrap up, and it simply doesn't work. "The Winds of Winter" is a deeply uneven episode in a number of respects: the majority of plot threads set up new stories for next year, but one ultimately decides to just begin tonight; the scripting ranges from emotional to mishandled in the space of a few lines; aesthetical touches change between scenes, forcing the episode into strange territory. 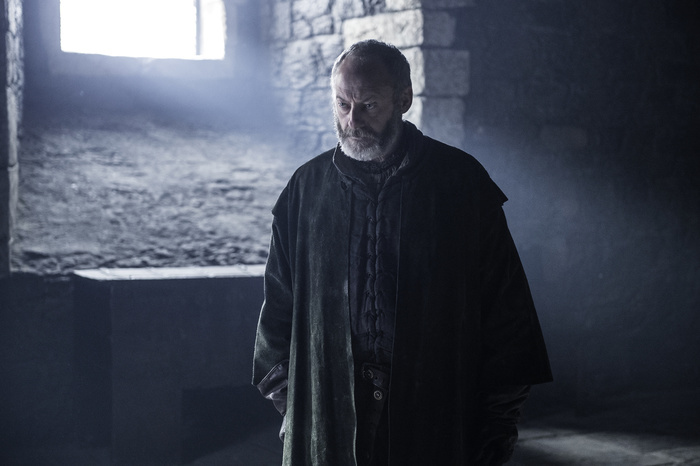 The superlative King's Landing sequence offers an entirely new aesthetic for the show, but after this the episode returns to normal and it feels strange. "The Winds of Winter" had me hooked and mesmerised for about half an hour, then it lost me a bit in the middle but pulled it back for a great ending sequence for the whole season. It's been an oddly shaped run - episodes have ranged from the strongest ever to the weakest ever - but it had a lot to accomplish, and I feel it's done its job admirably. This finale wipes out a number of narrative threads whilst binding a handful of others together. This should, hopefully, make for a more focused seventh season, and one that has room to show characters' journeys in the ways that the show used to, and make the smaller moments count. Game of Thrones used to be fantastic at making the smaller moments matter as much as the big ones, but it's lost that strength lately. The smaller moments may not be as thrilling, but we need them to make the big moments stick the landing, and the show won't return to the highs of seasons one through four until it regains this ability. Next year, guys. You need to make it the one. I really can't express how sad Tommen's suicide made me. I spent weeks speculating who would kill him in the finale, but I never expected it would be himself. Do you think Ser Pounce is still around? I hope so. Tyrion welling up when Dany gave him the pin was a nice touch, and nicely acted by Peter Dinklage too. Enormous credit to Ramin Djawadi: this was some of the best music he has ever made for the show. He doesn't get nearly enough credit. So that wraps up another year of Game of Thrones. As much as I enjoyed it, I feel like statistically it would rank as the weakest season, despite its handful of strong episodes. Episodes 6 - 8 really damaged the season's momentum, and the finale never fully recovered from it. Still, thanks to everyone who read any of these reviews. Game of Thrones can be a huge challenge to write about sometimes, so I hope it's worth it.